On May 20, 1945, Second Lieutenant Ryōsuke Ogiso took off from Chiran Air Base and died in a special (suicide) attack west of Okinawa at the age of 24. He was a member of the 50th Shinbu Special Attack Squadron and piloted an Army Hayabusa Type 1 Fighter (Allied code name of Oscar). After his death in a special attack, he received a promotion to Captain. He was from Aichi Prefecture, attended Senshū University in Tōkyō, and was a member of the 1st Class of the Army Special Cadet Officer Pilot Training (Tokubetsu Sōjū Minarai Shikan) Program. On the 9th I will depart from here. I am headed toward a base in Kyūshū and shortly I will make a sortie. Thank you for the many ways that you have cared for me until today. Please forgive my fault of leaving before you. However, in the end I will vanquish with all my might the hated, haughty enemy and carry out my important task to protect Japan. With this I will do my first and last act of filial piety for you. Before the sortie I am extremely enthusiastic. I am not thinking about anything. Of course I have no turmoil. With extreme joy and in high spirits I will make a sortie. After I die, please watch over my younger brothers and sisters . Some days ago I visited Ōyama-san , and he showed kindness to me in many ways. I will send my personal items (military uniform, military sword, and other things). I will participate in the 8th General Attack. 7 p.m. on May 20 is the time when I will attack. The Army Minister gave instructions to the Special Attack units. When the photograph is published, I am the 3rd person from the left on the 3rd row. The letters come from Chiran Kōjo Nadeshiko Kai (1996, 71-2). 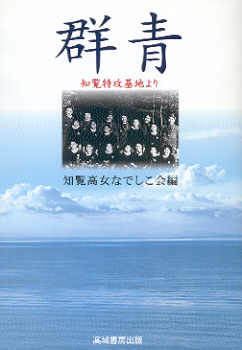 The biographical information in the first paragraph comes from Chiran Kōjo Nadeshiko Kai (1996, 71), Chiran Tokkō Irei Kenshō Kai (2005, 187), and Osuo (2005, 197). On May 20, 1945, one of the 50th Shinbu Squadron Hayabusa Type 1 Fighters hit the American ship LST (landing ship, tank) 808, but only five men were on board when the plane hit. More details are found in the story Kamikaze, the Ultimate Sacrifice. 1. The number of younger brothers and sisters is not specified in the letter. He may have had one or more younger brothers and one or more younger sisters. 2. The letter does not indicate whether Ōyama-san is male or female. Chiran Kōjo Nadeshiko Kai (Chiran Girls High School Nadeshiko Association), ed. 1996. Gunjō: Chiran tokkō kichi yori (Deep blue: From Chiran special attack air base). Originally published in 1979. Kagoshima City: Takishobō.